Air Lift LoadLifter 5000 Ultimate Air Spring Kits are air bag/air spring kits that are designed to easily and affordably keep your vehicle level and your ride quality smooth regardless of what you�re hauling, or the quality of roads you are driving on. This means better braking, steering, headlight aim, reduced sway and bottoming out. When carrying a heavy load, simply add some air to the Air Lift springs/bags, and that sagging load is now level. Simply remove the air when you�re done hauling (takes seconds), to return to normal ride height. When you order your Air Lift LoadLifter 5000 Ultimate Air Spring Kit, you�ll receive everything you need to install the Air Lift LoadLifter 5000 Ultimate Air Spring Kit on your vehicle. No additional parts are required. You can expect to spend an hour or less installing your new Air Lift LoadLifter 5000 Ultimate Air Spring Kit. Most enthusiasts will be able to easily install the Load Lifter 5000 Ultimate kit themselves. Be sure to view our Video Demo for a quick demonstration. A pair of easy to install pressurized air springs that provide a load leveling capacity of up to 5000 pounds are included. Designed to work together, the pair of air bags/springs will support the rear of your vehicle, offering a smooth and level ride. All brackets, air lines, fittings, hardware, and instructions are included. Some users choose to purchase the Air Lift On Board Compressor (sold separately on our website as an optional accessory), so their vehicle levels automatically. Each LoadLifter 5000 Ultimate kit includes Air Lift's exclusive upper and lower roll plates. These plates increase your load capacity by 10% and protect the air springs from sharp edges,like brackets and your vehicle's frame, ensuring the lifespan of your air springs. Each airbag also includes an internal jounce bumper inside the spring for the ultimate in ride comfort. 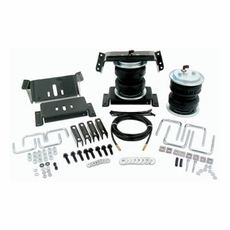 The part number for this Air Lift LoadLifter 5000 Ultimate Air Spring Kit is 57344 and it fits 2009-2012 Ford F-53 Class "A" Commercial Chassis (Does not fit 24,000 & 26,000 GVWR) models.